I am the only person I know who had the unusual good luck to grow up with a pomegranate tree right outside my bedroom window. It was a gorgeous thing, with small green leaves and lovely drooping blossoms, which became laden in October and November with large orange-fuschia-ruby colored fruit. It was my Dad’s pride and joy, and the talk of the neighborhood. My parents had a friendly pomegranate policy: any kid in the neighborhood who wanted one could have one, as long as they rang the doorbell and asked first, and if they ate it out on the curb near the storm drain, being careful not to throw the rind and seeds around on the sidewalk. My father would spend several nights each Fall sitting at the kitchen table (covered with the newspapers he read faithfully each day) carefully removing the arils from dozens of pomegranates so my mother would make pomegranate jelly and grenadine (pomegranate liqueur). My mother didn’t have the patience to do it, so their agreement was that she would make the treats if he would seed the fruit. The arils (we called them seeds) would go into the freezer in plastic containers and bags until my mother was ready to use them. My Dad also savored these over the rest of the year by topping his morning cereal and evening ice cream with ruby red arils. I don’t usually buy pomegranates in the store, because they rarely even come close in ripeness to the ones I remember from my childhood. But this year I decided to take a chance. Perhaps I was prompted by the lovely impressionistic oil painting of two pomegranates painted so long ago by my art teacher as a gift to my parents, and then given to me by my sister a few Thanksgivings ago. For years it hung over their fireplace in the house they moved to after we grew up, to remind them of the magical tree they left behind. Now it hangs in my living room like an old friend, whispering shared memories that would otherwise go completely silent. My son and I have an ongoing conversation about how the right user can find the answer on the internet for how to do just about anything. When he and Kelly were here for Thanksgiving, I asked him if he would seed a pomegranate for me I had bought to put into our Thanksgiving kale salad. All you have to do is say to Mike that something takes a long time, and he is off in search of the fastest way to do it. So I shouldn’t have been surprised when I entered the kitchen to complete another task and saw him pounding on the backside of a pomegranate half with a wooden spoon. “What are you DOING? !” I blurted out, concerned he might be damaging an expensive piece of organic fruit. Kelly smiled and pointed to his iphone on the counter and then I understood. He was watching this delightful video on youtube about how to spank the seeds out of a pomegranate. As he slapped the rind, out came the jewel colored arils like heavy red rain drops into the blue bowl. He grinned at me, and spanked the fruit some more, then showed me the empty half. Voila. The internet had trumped a time honored family labor of love. I laughed. And laughed even more when I watched the young man, probably close to Mike’s own age, demonstrate the technique and remonstrate his viewers not to give in to taking the arils out the traditional way. I envisioned my Dad exclaiming in the afterlife how knowing the spanking trick would have saved him so much time. I thought maybe the old way was gone for good. So after the kids left I bought another pomegranate. Like my Dad, I wanted to have some of those seeds in my breakfast bowl (although mine was filled with a good deal of kale, and buckwheat groats instead of grape-nuts). I watched the video again and proceeded to spank the fruit. But something was wrong. I got maybe 3 or 4 seeds out. I spanked my hand accidentally rather hard. I tried “loosening the edges of the rind. By this time my wrists were pretty tired. Although I am stronger than I used to be, repetitive motions like that can still weaken me and compromise accuracy. But something more important was happening. As I turned the opened half of fruit back over, my hands felt the childhood hands in them come alive again: the ones that had sat outside with my best friend Susan, pulling apart the beautiful fruit on a lovely evening. 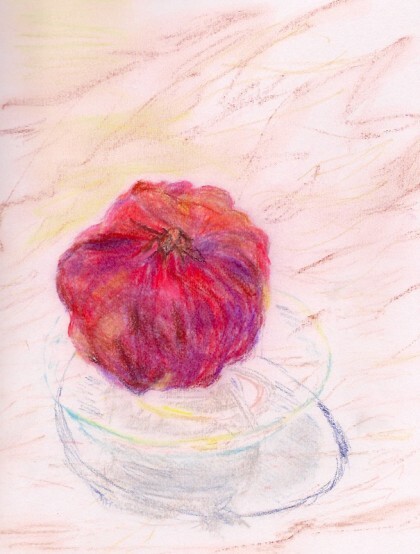 I saw–again–and felt–how the pomegranate is shaped like a 3 dimensional star inside, and that all I had to do was follow the shape and whole sections of seeds would come into my hands. Doing it the “slow way” that takes “too much time” brought all the memories back. And to make those memories even more crystal clear, this particular pomegranate was actually so ripe the arils were the dark garnet color I remember from our tree. And they tasted like some of the happiest moments in my childhood. I mentioned my failure to spank to one of my favorite people who works in the produce department at the co-op and she said, “Oh, it’s so easy!! Let me show you.” And she took me and Romeo and a pomegranate into the produce kitchen and I watched as she scored the edges of each half and then expertly tapped all the seeds out by simply hitting the fruit with the back of the paring knife. I was impressed, and resolved to try again. But the same thing happened. I actually wanted to feel the shape of those lovely three dimensional star tips full of seeds spread themselves slowly in my fingers and hands. I wanted to do what my hands knew how to do. I must have helped my Dad do this more than I actually remember. I know I was very impressed with his patience and dedication. I think we sat there together working the seeds out. We were the only two in the family that had the patience for it. It’s not surprising that a woman who calls her blog Plant-Based Slow Motion Miracle would decide she’d rather not spank the seeds out of her pomegranate. I decided it might be a matter of whether you are a person who rips open your presents, or one, like me, who carefully unties the ribbon and unfolds the paper. Mike liked that distinction. And so did my friend at the co-op. She went even further. She said there’s really no need to do it that way, especially if you’re just going to eat one pomegranate. And that when she went to visit her Mom over the holiday she had had the same trouble with it I had. Maybe she’s also a person who opens her presents slowly. To find the past alive in my hands is something worth going slow for. But if you’d like to learn to spank, you have my blessing. And Mike’s. And that of my friend at the Co-op. However you mine the aril-jewels from the fruit, I hope you enjoy the pomegranates that may come your way in this life. They are truly treasure buried in a fruit. They’ll soon be gone for the rest of the year. But until they are, I’m savoring each slow picked delicious gem. Maria, I loved this post, especially your reaction to Mike spanking the pomegranate! It reminded me of a vacation my family and I took about 3 years ago to Sequoia National Park. We were staying just outside the park in a small house surrounded by pomegranate trees. The owners of the rental house lived just up the hill, and they made the most delicious pomegranate juice, which they shared with us. It was a rare treat, so different from the packaged kind. I envy you your childhood pom. tree! Thank you, Susan! Wow, I loved this story about staying in a house surrounded by pomegranate trees–that is truly a fairy tale come true–for me at least!! I can just imagine how wonderful the taste of that homemade juice was! I cherish my memories of our pomegranate tree. I’ve never had pomegranate fresh from the tree before – always just purchased in the store. I, too, prefer the slow way of getting the seeds out… there’s just something peaceful about doing that, and coaxing the red seeds out, and licking your fingers after “accidentally” crushing a couple… 🙂 I think I’ll buy a couple more at the store tomorrow! Thanks for the lovely post – it transported me to your kitchen, both in the past and the present. Dear Veronica, so nice to hear you prefer the “slow way” too!! Yes, the licking of fingers is an unavoidable pleasure!! I am so happy to know this post transported you to my kitchens both past and present. I’ll think of you when I pick out my last few pomegranates at the store!! Dear Maria: I love seeing plants through your eyes. would let us pick a few pomegranates in the fall. Dear Maria, I have wonderful images of a child’s intensity as she copies her Father in a new task =) I only recently tried my first pomegranate coming from a temperate part of New Zealand. I grew up in a room next to a bank growing silver beet (I think you call it chard). Nowhere near as evocative of pleasant memories, just whispers of, ‘you can’t have any pudding until you have finished your silver beet’. Your writing wraps readers in a web of images, bringing your thoughts to life, a rare skill. Thank you so very much for this lovely essay about my favorite fruit. I just sent New Year’s wishes to my FB friends wishing them a year of fruitfulness as lovely as the 1543 pomegranate seeds I just relished. One of them forwarded your column. Delicious all the way around. Salud! y gracias. Welcome, Jeanne, and thank YOu for taking the time to write this wonderful comment. I have to say the pomegranate is one of my favorite fruits as well–though I have a hard time picking just one!! I love your wish for fruitfulness as lovely as a wealth of those wonderful seeds. Here’s to a delicious year!! Love pomegranate spanking – turns out I have a friend in Sacramento ( South Land Park) with a pomegranate in his yard too. He, like Mike, is all about youtube how to do its – so he may have this figured out already. OTOH – if not, he’ll sure be happy to know or even brag about knowing already, hehehehe. South Land Park!! Oh my, that brings back memories. . .good ones. . so good to hear about another Sacramento pomegranate tree. 🙂 Glad it will be fun for you to share this with him! 🙂 Thanks! Dear Maria, I really enjoyed your childhood memories of getting the arils out of the pom fruit. It is a job to master, and I am still working on it. We did not have a tree, but my mom loved to try out different items that looked exotic just so that we could try something new and different. They are a very special treat, I agree. Good luck with your newest card and arts, they are so pretty. I am meeting up with more and more ladies who tell me they have MS and I want to tell them about your blogg and hope to do that one day soon. I am one of the lucky ones to have a tree in my backyard. I am like your father in that I love to sit and peel back the skin and gently remove the arils. I have tried the spanking method and found that it can be very messy if you hit too hard and bruise the arils which makes for a messy hand and counter. Even with a bowl under I seemed to make a mess. I like the idea of reminiscing while peeling them, thinking back to the first time, at ten years old when we moved from Wisconsin to Southern California and rented a house at that time that had a huge Pomegranate tree. I was fascinated from that first picking. Welcome, Carla! Thank you so much for this comment! I am so happy to “meet” someone else who is one of the lucky ones with a pomegranate tree in their yard! And so very wonderful to know how you love the “slow” way, too. I really appreciated reading all that you shared here. Thanks for following along. I gained some ideas from this fun pomegranate post. We love pomegranates on salads and hot and cold cereal but I agree about how hard it is to remove the seeds. I decided to try the spanking and accidentally cut the pomegranate in the wrong direction and had no success getting the seeds out. Then I decided to quarter them in the same wrong direction and push the peel so the pomegranate seeds were easier to access. That made it terrifically slick for removing the seeds in no time. Thanks for the great post, now if I could just find more pomegranates!